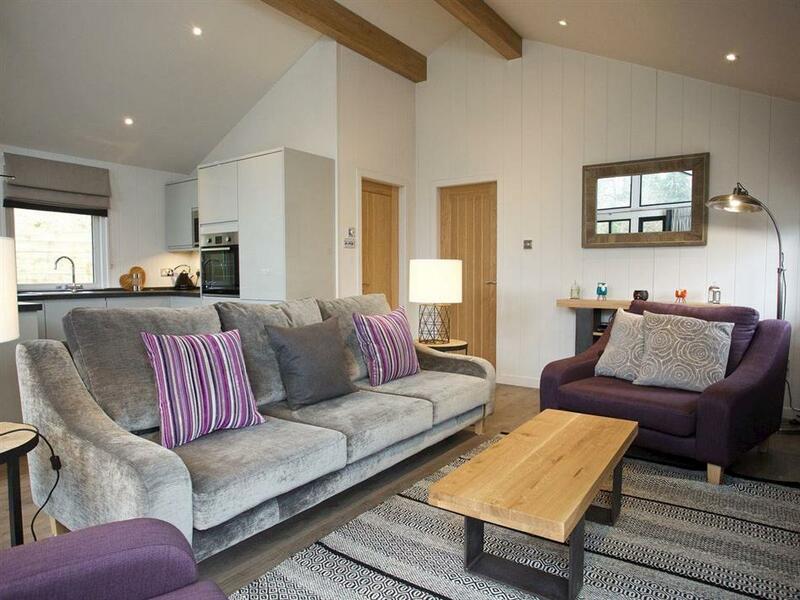 Eldersburn Lodge at Loch Tay Highland Lodges in Killin, Perthshire sleeps 6 people. Loch Tay Highland Lodges in Killin are surrounded by splendid views in an elevated position on the shore of Loch Tay and set in 160-acres for you to explore and enjoy; this is the perfect location for families, friends and couples. There are lots to explore on foot and activities on-site to suit all ages and tastes including a children’s play area, archery, disc golf and an 18-hole putting green, water sports and boat hire, shore and loch fishing, all surrounded by the spectacular scenery of mountains, countryside, rivers and Loch Tay. Eldersburn Lodge stands detached and boasts a private hot tub and super south facing views over Loch Tay and across to Ben Lawers Mountain. It is a great location for a weekend break with friends to relax and unwind. A spacious open plan living area with a wood burner, where guests can sit together and plan the day’s activities, makes it a cosy place to come back to after a day on the loch or exploring the local area. A patio door leads from the open plan living space to the decked area, just the spot for a summer barbecue. The shop is 3 miles from Loch Tay Highland Lodges in Killin, with the pub and restaurant 600 yards from Loch Tay Highland Lodges. Eldersburn Lodge can be booked together with Acharn Rocks (ref UK5741 [Acharn Rocks]), The Pheasant Rock Lodge (ref UK5742 [The Pheasant Rock Lodge]) and Waterfall Lodge (ref UK5744 [Waterfall Lodge]) to sleep up to 24 people. Eldersburn Lodge is al on the ground floor. Open plan living space: With wooden floor and patio door leading to decking. Living area: With wood burner, 48’’ Freeview TV, DVD player and iPod dock. Bedroom 1: With double bed, 16’’ Freeview TV, DVD player and en-suite with shower cubicle, toilet and heated towel rail. Electric central heating, electricity and bed linen included. Towel hire. Wi-Fi at cost. Initial logs for wood burner included. 3 travel cots and highchair available on request. Decked area with garden furniture and firepit. 160-acre natural woodland with sitting-out area and garden furniture (shared with other lodges on-site). Hot tub for 6 (private). 2 dogs welcome, to be kept on a lead at all times (sheep country). Fishing on-site (at cost, licence required). Private parking for 4 cars. No smoking. Please note: The property has a natural water supply from a spring. There are steps to the hot tub, steps, an unfenced stream and unfenced loch in the grounds, 600 yards away. Holidays at Eldersburn Lodge, Loch Tay Highland Lodges run from Monday to Monday. Pets allowed at Loch Tay Highland Lodges - Eldersburn Lodge. For a better idea of where Loch Tay Highland Lodges - Eldersburn Lodge is, you can see Loch Tay Highland Lodges - Eldersburn Lodge on the map below. 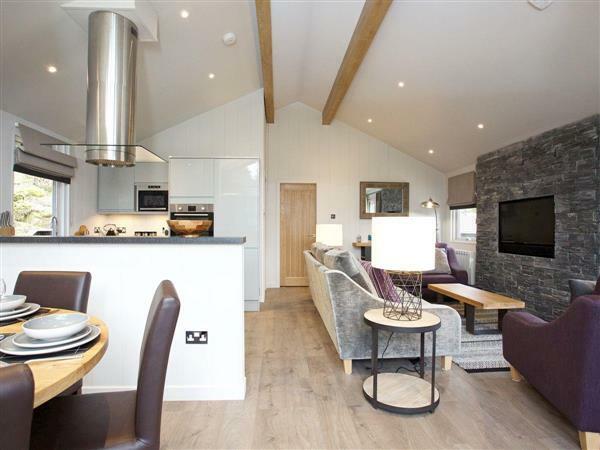 Loch Tay Highland Lodges - Eldersburn Lodge is in Perthshire; should you be on the lookout for a special offer, you can find all the special offers in Perthshire. It's always worth checking to see what is on offer at the moment. Do you want to holiday near Loch Tay Highland Lodges - Eldersburn Lodge (UK5743), you can see other cottages within 25 miles of Loch Tay Highland Lodges - Eldersburn Lodge; have a look to find your perfect holiday location.